Nancy Handley, born August 29, 1940, was called to her eternal resting place by her Lord and Savior on May 3, 2016. Nancy was born in Novice, Texas to Charles and Beulah Cary. 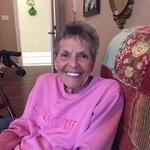 She is survived by her brother Tommy and wife Glenda Cary, sister Charlene and husband Robert Gray, son Doug and wife Sue Handley, daughter Gala and husband Kevin Dean, daughter Summer and husband Charlie Heath. Nancy had six grandchildren, Heather and husband Jared Ede, Melissa and husband Cody Stansell, Tiffany and husband Jason Melton, Kolby Dean, Savannah Heath and Tyler Heath. Nancy also had four great-granchildren, Madi Kate Melton, Emery Melton, James Melton and Jett Melton. She was also survived by numerous nephews and nieces, other relatives and friends. 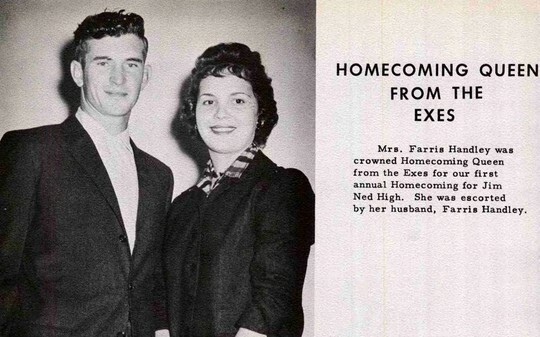 Nancy married the love of her life, Farris Handley, on December 21, 1957. The couple lovingly served the Jim Ned community their entire lives, sharing their love, devotion, and commitment through a variety of avenues. Nancy adored and supported her Jim Ned Indians in every capacity possible. Nancy's beautiful smile was highly recognized by all whose lives were touched by her and she left a sparkle of God's love wherever she went. Visitation will be held at the Tuscola United Methodist fellowship hall on Friday, May 6, 2016 from 6:00-8:00 PM. The memorial service will be held at the Tuscola Cemetery at 1:00PM Saturday, May 7.. Funeral arrangements directed by Fry-Smith Funeral Home in Tuscola, TX.